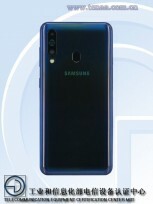 Samsung Galaxy A70 and Galaxy A60 appeared yesterday on TENAA, but only with pictures and basic specs. A day later the A70 was already announced, while the latter got its listing completed with all its specs. TENAA reveals that the Galaxy A60 will arrive with a 32 MP in-screen selfie camera, tall 19.5:9 screen and 6GB or 8 GB RAM. 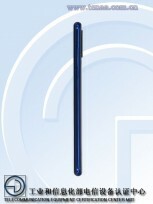 The screen is 6.3” in diagonal and has Full HD+ resolution. The CPU is listed as “2.0 GHz/1.7 GHz” which we assume is an unreleased octa-core Exynos chipset with two power cores at the higher frequency, and the other six are of the Cortex-A53 variety and working at the lower rate. Alongside the two RAM options we also see two storage choices - 64GB and 128GB. While the selfie camera looks impressive with likely an ISOCELL GD1 sensor, the triple setup on the back is not that exciting - 16 MP normal lens, 8 MP camera, likely with a telephoto lens, and a 5 MP depth sensor. 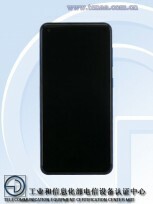 Other specs of the Galaxy A60 like Android Pie and 3,410 mAh are known from yesterday’s leak, but today TENAA also revealed the device will come in Black, Blue, and Orange, the last likely being the Coral color we’ve already seen in multiple other Galaxy A smartphones. We are still waiting to see if Samsung will make the Galaxy A60 a part of its April 10 event or if it will debut sooner than that. finally a decent mid range phone with reliable FP but what does somesung does? makes the battery 3400 , wtf somesung really? I think the A series design is better than the S series even if they are under-specced. It will go in the A90. If there's another high end A, like an A80 it might go in that one too.